As we’ve explored in earlier discussions (see here), the Mahāvairocana-sūtra 大日經 is a key example of early Mantrayāna. I've suggested that the teacher of Śubhakarasiṃha 善無畏 (637–735), a certain Dharmagupta from Nālandā, was its likely original human author (tradition states it was transmitted to him from Vajrapāṇi Bodhisattva). Śubhakarasiṃha translated it into Chinese in the year 724 with the assistance of the Chinese monk Yixing 一行 (683–727), who was also an erudite court astronomer. The associated maṇḍala is described in the text and elaborated on in the subsequent commentary that was penned by Yixing who also recorded Śubhakarasiṃha’s oral instructions. 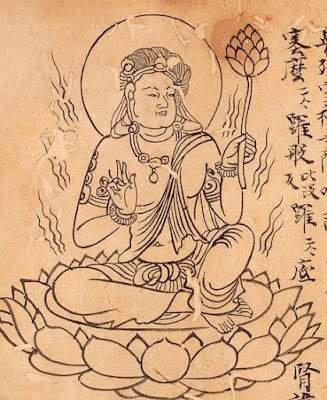 The visual depiction of the maṇḍala is the *Garbhadhātu-maṇḍala 胎藏界曼荼羅 (otherwise Garbhōdbhava-maṇḍala), which was preserved in Japan, though there are several versions with minor variations. Moreover, he manifested the appearances of vajradhara-s, and the bodhisattvas Samantabhadra and Padmapāṇi, and proclaimed throughout the ten directions the pure-worded Dharma of the Mantra path: that the stages from the first generation of [bodhi-]citta up to tenth [can be] progressively fulfilled in this lifetime. The gate into the entry of Mantra generally includes three items. The first is the gate related to the mysteries of body. The second is the gate related to mysteries of speech. The third is the gate related to mysteries of mind. These matters will be broadly discussed below. The practitioner purifies their three karmas through these three means. It is by being empowered [*adhiṣṭhāna] with the three mysteries that it is possible to fulfill the pāramitā-s [and] bhūmi-s in this lifetime and not further pass through numbers of kalpas. The remark that it is unnecessary to pass through kalpas is in reference to earlier Mahāyāna belief that asserts the bodhisattva must be reborn immeasurable times and perfect ten separate stages or grounds (the bhūmi-s) over the course of three great asaṃkhya (incalculable) kalpas before being in a position to attain buddhahood. These stages are outlined in the various versions of the Daśabhūmika-sūtra. 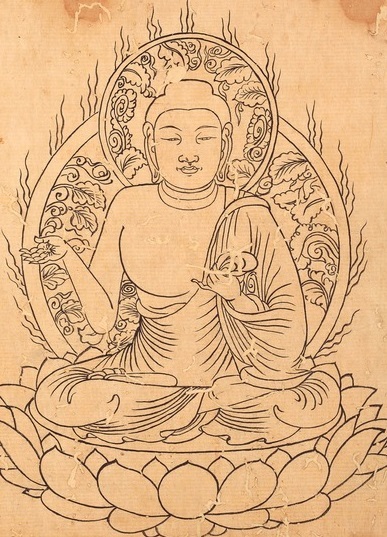 The voluminous Avataṃsaka-sūtra includes this sūtra. The formulators of the early Mantrayāna movement effectively rendered other prevailing Mahāyāna systems obsolete and defective by teaching that buddhahood is possible in one lifetime. Mantrayāna emerged in India – likely in the region of Magadha and centered in institutions like Nālandā – in the seventh century when the two main Mahāyāna traditions included Madhyamaka and Yogācāra. The earlier Mahāyāna program for bodhisattva training requires immeasurable lifetimes before full buddhahood can be attained, but the path of Mantra provides expedited attainment in the present life of anuttarā-samyak-saṃbodhi via the empowerment or adhiṣṭhāna of Mahāvairocana. An analogy for this is given in Yixing’s commentary: if you ride a goat it will take a long time to arrive somewhere, but a horse will be faster. If you ride with someone with supranormal powers (abhijñā), then you arrive in the span of time of a thought. In this case, the argument can be made that while the earlier bodhisattva path requiring many lifetimes is still valid, why follow such a path when buddhahood is possible in this lifetime? This is also an argument often given by Tibetan Lamas today. I suspect this is one reason why Mantrayāna (or Vajrayāna) became the dominant tradition of Mahāyāna in India, which is demonstrated in the art record. As noted above, there were diverse ideas of what a buddha is and who the Buddha was in India. We might suggest that there were two general conceptions of the Buddha in early Buddhism which were divided by a major sectarian divide. As Buddhist tradition explains, the early sangha was split into two communities: the Sthaviravāda and the Mahāsāṃghika. The Sthaviravāda branch produced the Sarvāstivāda school which became one of the most dominant traditions of Buddhism in India, though it no longer exists. Their heartland was in northwest India around the region of Kashmir. As their name implies, they taught that all dharmas (phenomena) are existent. A person might be comprised of existent dharmas, but there is no self (ātman) to be found within them. It was within such an ontology that they formulated the two-body theory consisting of a rupakāya and the dharmakāya. 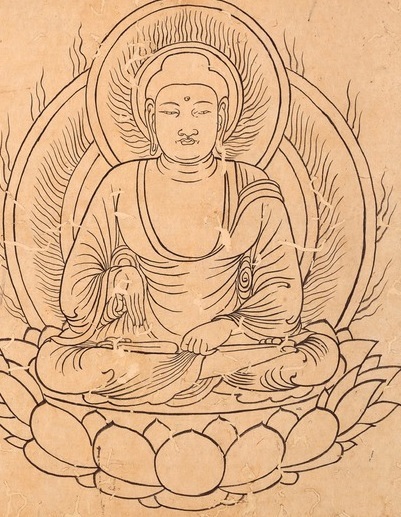 As Venerable Guang Xing explains in his work The Concept of the Buddha, the former is impure but possesses the thirty-two major and eighty minor marks. The latter possesses eighteen features including the ten powers, four kinds of intrepidity, the three foundations of mindfulness, and great compassion. The Buddha in their view was a liberated sagely arhat, but still possessed a body of impure matter. 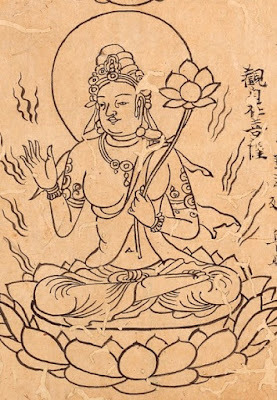 The Mahāsāṃghika tradition, which I tend to think was centered around Magadha in eastern India, viewed Śākyamuni as a form of an underlying “true Buddha” which is a transcendental (lokottara) and omniscient, arising to liberate beings in diverse ways. These were the prototype concepts behind the later Mahāyāna conceptions of the dharmakāya, sambhogakāya and nirmaṇakāya. The Mahāsāṃghikas furthermore suggested that many other buddhas existed simultaneously in other worlds. Such a belief foreshadowed the emergence of figures like Amitābha Buddha, said to reside in the western realm of Sukhāvatī (known as the ‘Pure Land’ 净土 in East Asia). In light of such differences with respect to the definition of buddhahood, it is very likely that Mahāyāna – or at least the version which led to the formation of the ten-stage bodhisattva path and eventually Mantrayāna – emerged from the Mahāsāṃghika lineage and not any Sthaviravāda lineage. There is one interesting story preserved in the Chinese canon which supports this thesis. 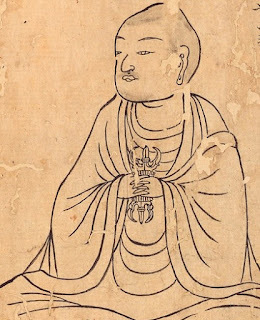 Jizang 吉藏 (549–623) in his treatise on Madhyamaka philosophy – the Sanlun xuanyi 三論玄義 – provides the following account. The Mahāsāṃghika only promulgated the shallow teaching, abandoning the deep teaching. When the Buddha was in the world there was a sage who met the Buddha and attained arhatship. He constantly followed the Buddha to other lands and listened to the Dharma in the heavens. At the time of the Buddha’s nirvāṇa the man was not present. He sat in meditation in the snowy mountains. Two-hundred years after the Buddha passed away, he emerged from the snowy mountains seeking fellow practitioners. He saw that the Mahāsāṃghika were only promulgating the shallow teaching, unaware of the deeper Dharma. That man fully recited the shallow and deeper teachings. The deeper teachings included the Mahāyāna teachings. The Satyasiddhi-śāstra emerged from this school. At the time there were those who believed in what he taught and thus there formed another school, called the Bahuśrutīya. This story in a similar form is also found in the Yibu zonglun lun shuji 異部宗輪論述記 (X 844), a commentary by Kuiji 窺基 (632–682) on an earlier Buddhist history which is attributed to Vasumitra, a scholar from Gandhāra in the first century CE, and translated by Xuanzang 玄奘 (602–664). It states the sage’s name was ‘Consecrated Bark Robe’ 祀皮衣. It does not, however, mention the Mahāyāna, which suggests the story Jizang is citing is from a later source that inserted the entry of Mahāyāna into an otherwise familiar point in Buddhist history. It suggests an awareness that the origins of the Mahāyāna were missing from the historical memory of the Buddhist community and thus its teachings had to be somehow traced back to Śākyamuni in order to be validated. It thus seems quite plausible to me that individuals within the Mahāsāṃghika lineage were responsible for the early formulation of the Mahāyāna. The Mahāyāna tradition built on earlier Mahāsāṃghika concepts and produced scriptures describing the careers of bodhisattvas, and the existence of other presently existent buddhas such as Amitābha and Akṣobhya. They further formulated the figure of Vairocana – a kind of personified ‘cosmic buddha’ – who emanates the buddhas such as Śākyamuni. An immediate example of him in the Chinese canon is found in the Brahma Net Sūtra 梵網經 (T 1484). Although this text is believed to have been composed in China, it clearly was based on earlier Indian materials. It is moreover datable to sometime in the fifth century. Incidentally, this is figure of Vairocana is famously represented as a bronze statue at Tōdai-ji 東大寺 in Nara, Japan. To summarize, the Mahāsāṃghika lineage with their variant vision of buddhahood produced individuals who sought to formulate a path through which they too might attain something superior to arhatship or the complete cessation of saṃsāra. This led to the model of the bodhisattva path comprised of ten bhūmi-s or stages of practice carried out over immeasurable lives throughout three great asaṃkhya kalpas. 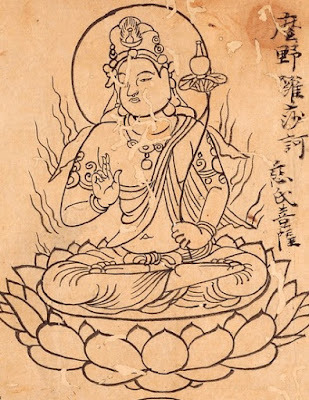 The concepts of multiple buddhas and a transcendental dharmakāya (personified as Vairocana) as the source of emanations (nirmaṇakāya) were further refined and integrated into Mahāyāna sutras. 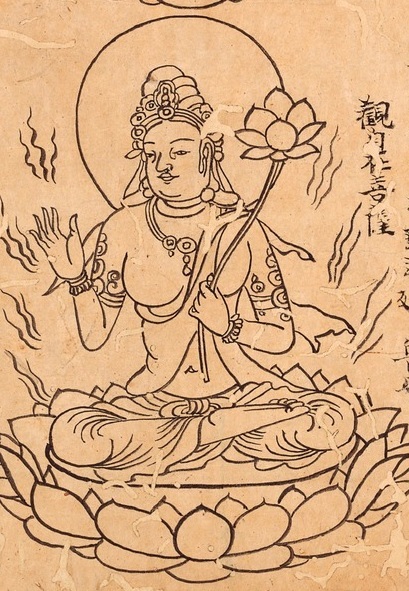 At some point in the seventh century in the region of Magadha, Mahāyānists associated with Madhyamaka conceived of a system of expedited attainment enabling one to rapidly progress through the bodhisattva bhūmi-s and pāramitā-s in one lifetime by drawing on empowerment from Mahāvairocana – conceived of as an embodiment of the dharmakāya from which all nirmaṇakāya-s emerge – through integrating one’s body, speech and mind with that of Mahāvairocana. This new system and its methods were explained in the Mahāvairocana-sūtra, accompanied by its associated maṇḍala. Having outlined the background history in brief, we can now explore the maṇḍala and discuss the new conceptions of buddhahood that were integrated within the practical framework of the Mantrayāna system while examining some of the features of the core center of the maṇḍala. The core of the maṇḍala is the “center platform court of the eight-petaled lotus” 中臺八葉院. Center Platform Court of the Eight-Petaled Lotus 中臺八葉院. 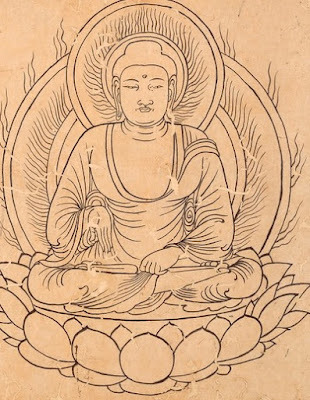 For the purposes of this discussion, we can make use of the sūtra, Yixing's commentary, the maṇḍala and some separate illustrations provided in the Taizō zuzō 胎藏圖象. The latter is comprised of two fascicles (scrolls) and includes illustrations of the maṇḍala deities. It is based on materials brought to Japan from China by the Tendai monk Enchin 圓珍 (814–891) who made copies in the year 855 at Qinglong-si 青龍寺 in the capital, which was at the time the foremost institute for Mantrayāna studies in East Asia. 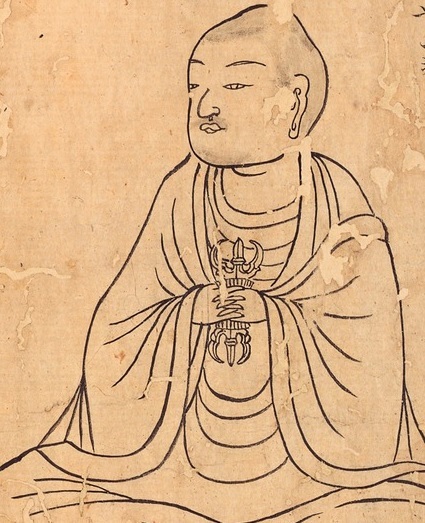 There are variant versions of the maṇḍala figures such as the Genzu mandara 現図曼荼羅 which is based on the copy Kūkai 空海 (774–835) brought back with him from China. 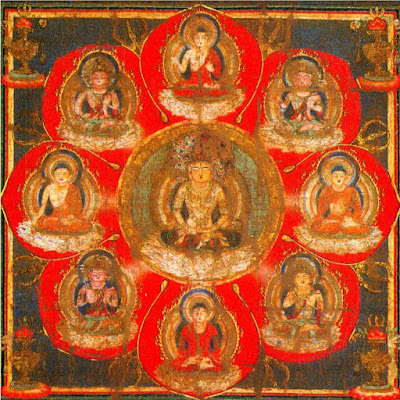 Mahāvairocana Buddha is seated in the very center of the *Garbhadhātu-maṇḍala and surrounded by eight figures: four buddhas and four bodhisattvas. Śākyamuni Buddha is not included here. The maṇḍala is oriented so that the left-hand side is north. Ratnaketu means the production of bodhicitta. Just as a general commanding a great mass requires a banner before the ranks become unified and able to destroy the enemy country, achieving great merit and fame, so too are the myriad practices of the Tathāgata like this. With omniscience and vows as a banner he defeated the armies of the four Māras under the Bodhi Tree. Hence the name. In the south is Saṃkusmitarāja Tathāgata 開敷華王如來. 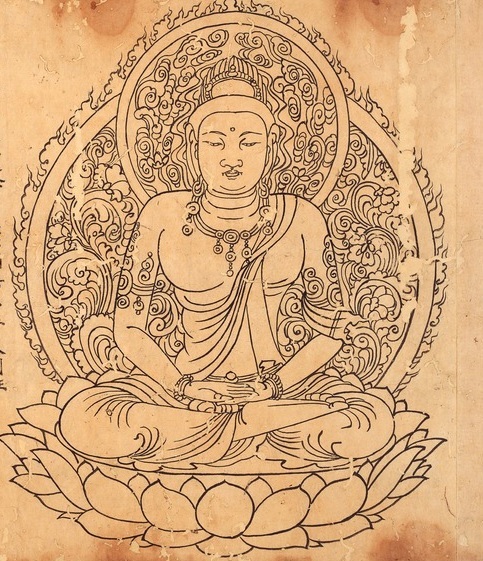 The Mahāvairocana-sūtra in relation to this buddha describes the flower of enlightenment blossoming, golden color emitting light and separation from defilements in samādhi, which represents the maturation of the seed of bodhicitta and its subsequent blossoming. The commentary gives his longer name as “Śāla Tree King Flower Blossoming Buddha” 娑羅樹王花開敷佛. It furthermore explains that his golden body emitting light is the mark of abiding in the samādhi separating from defilements. Separation from defilements here is defined as realization of great emptiness, which is likened to gold refined and completely free of impurities. He corresponds to Ratnasaṃbhava Tathāgata 寶生如來 in the Vajradhātu. Next in the western direction visualize Amitāyus Buddha. This is the upāya wisdom of the Tathāgata. As the realms of beings are inexhaustible, the upāya of great compassion of the buddhas is also unending, hence the name ‘Immeasurable Life’ [Amitāyus]. Finally, in the north is Divyadundubhimeghanirghoṣa Tathāgata 天鼓雷音如來. 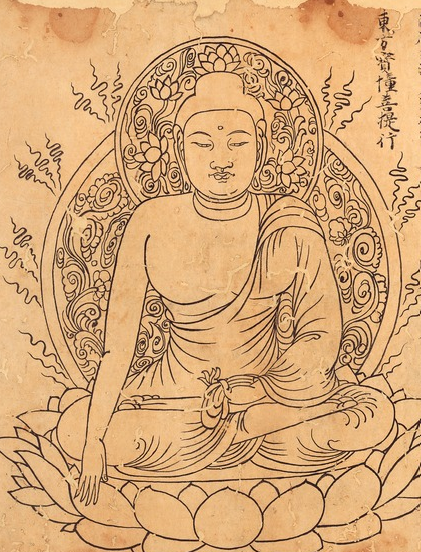 The Mahāvairocana-sūtra describes him as the “unmoving Buddha” 不動佛, separated from afflictions and in pure samādhi. The commentary defines him as the nirvāṇa wisdom 涅槃智 of the Tathāgata, hence the meaning of unmoving. 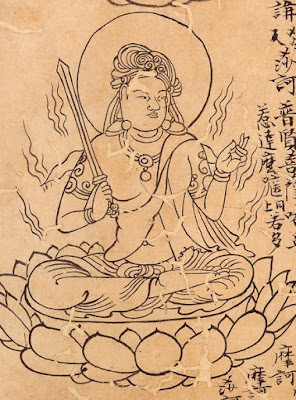 His original name is stated to be “Sound of Drums Tathāgata” 鼓音如來. The teaching of Dharma and awakening of beings is likened to celestial drums which are formless and non-abiding, just as mahā-parinirvāṇa is. He corresponds to Amoghasiddhi Tathāgata in the Vajradhātu. The four bodhisattvas are also interpreted as aspects of Mahāvairocana. Samantabhadra 普賢 occupies the southeast direction. He signals the development of virtues related to bodhicitta. The commentary defines samanta 普 as ‘pervading all places’ 遍一切處, and bhadra 賢 as most profound goodness 最妙善. He represents the vows and practices 願行 that arise with bodhicitta via body, speech and mind 身口意 which pervade all places equally. Mañjuśrī 文殊師利 occupies the southwest direction. 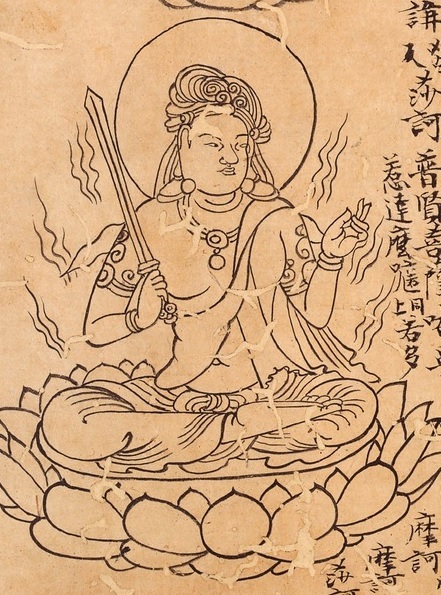 The commentary identifies mañju 妙 as the unexcelled wisdom of the Buddha 佛無上慧, which is likened to the foremost purity of ghee. Śrī 吉祥 is identified as the possession of virtues, excellent virtue or excellent sound. Elsewhere in the commentary Mañjuśrī is identified as great wisdom 大智慧. 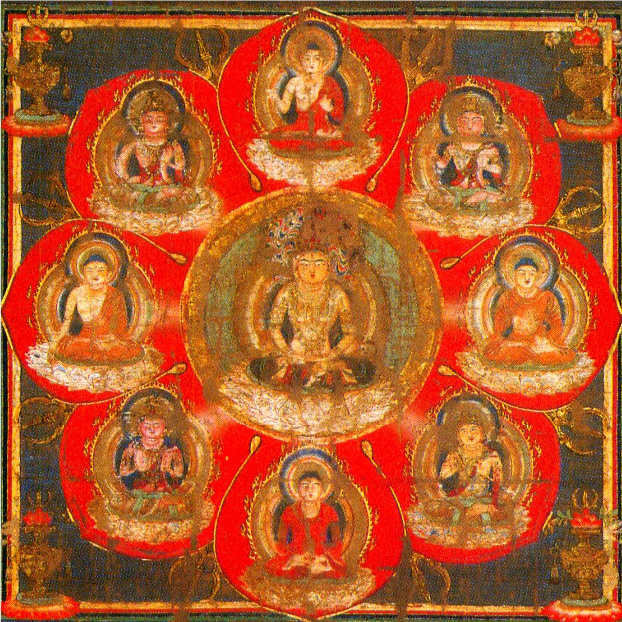 Samantabhadra, who is associated with bodhicitta 菩提心, precedes Mañjuśrī. The wisdom of emptiness purifies the all pervasive bodhicitta 遍一切處淨菩提心. Thereafter the sharp blade of impartial wisdom severs the roots of ignorance and one attains true bodhisattvahood. It is curious that Samantabhadra is the one depicted with the sword and not Mañjuśrī. I am not quite sure why this is. An alternate depiction of Samantabhadra shows him holding a lotus with a sword standing upright atop it, and Mañjuśrī holding a lotus with a vajra placed atop it. This is perhaps an earlier representation of Mañjuśrī. Avalokitēśvara 觀自在 occupies the northwest direction. The commentary briefly identifies him with realization, which is defined as the full completion of practices and vows. Finally, Maitreya 彌勒 (慈氏菩薩) occupies the northeast direction. He is depicted with a vase, which is said to hold the water of wisdom. The commentary identifies him as the four immeasurable states of mind 四無量心 (catvāri-apramānāṇi) of the Buddha: maitrī (benevolence), karuṇā (compassion), muditā (joy) and upekṣa (impartiality). His name is derived from maitrī 慈. This benevolence is born from the family (*gotra) of the Tathāgata. Elsewhere in the commentary Maitreya is identified as great benevolence and compassion 大慈大悲. The above descriptions provided by the sūtra and commentary interpret the buddhas and bodhisattvas as specific aspects of Mahāvairocana. We should recall that Śubhakarasiṃha was a direct disciple of the probable human author of the Mahāvairocana-sūtra, hence his remarks, which are included in the commentary, are likely reflective of what he was taught by his master. In the case of a shallow explanation of the meaning, the ‘master of mysteries’ (*guhyakādhipatiḥ) is the yakṣa king. The Vajradhara constantly attends to and protects the Buddha, hence the name Vajrapāṇi. However, therein is a deep meaning: the yakṣa is the mysteries of the Tathāgata’s body, speech and mind. Note here that this is a play on the original Sanskrit words that Śubhakarasiṃha had in mind (this is not immediately evident in the Chinese): guhya in guhyakādhipati means secret or mystery (adhipati or adhipa means ruler or master), hence the title of ‘master of mysteries’ could be associated with three mysteries of the Tathāgata’s body, speech and mind. This is an example of the creative license of upāya, motivated by compassion and rooted in bodhicitta. Vajrapāṇi can be understood either as a conventional bodhisattva or as having a deeper symbolic function. Such an interpretive model should be furthermore understood in relation to the two truths or realities of Madhyamaka (in English often understood as ‘conventional and ultimate truths’). It seems that Mantrayāna emerged within the context of Madhyamaka rather than Yogācāra in the seventh century (they were the dominant schools of Mahāyāna thought at the time), but Mantrayāna permits itself to work within various stages between the conventional reality of ordinary appearances and complete negation of phenomena at the ultimate reality. 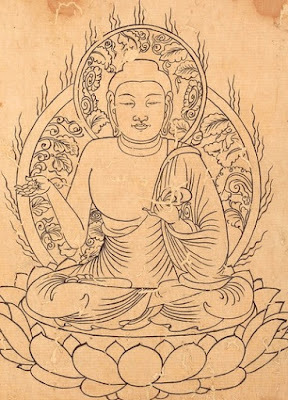 The Mahāvairocana-sūtra emphasizes emptiness (śūnyatā), but the system of practice requires active use of conventionally existent phenomena which are reinterpreted towards soteriological aims. In other words, realization of śūnyatā leads to basic release from saṃsāra (one of the basic requirements of advanced bodhisattvahood in conventional Mahāyāna), but buddhahood in a single lifetime requires applied wisdom with the understanding that all perceived phenomena are of an imputed existence and hence can be creatively employed towards the aim of anuttarā-samyak-saṃbodhi.